The book Homo Helveticus by Till Schaap Edition with a foreword written by Thomas Maissen in german, french and english languages. 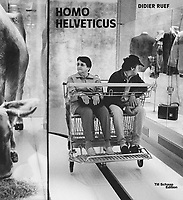 Homo Helveticus is about Switzerland. Everything you've always wanted to know about the country, just differently. A look without neutrality with love and irony at my country. The book was published on November 2018.